Start by going to your Uptime Monitors dashboard. Click the “Add Monitor” button from the Uptime Monitors page. You’ll notice a pop-up window appears. Select “Website” from the select list. Now the window just expanded to contain more fields, which we’ll go through below. 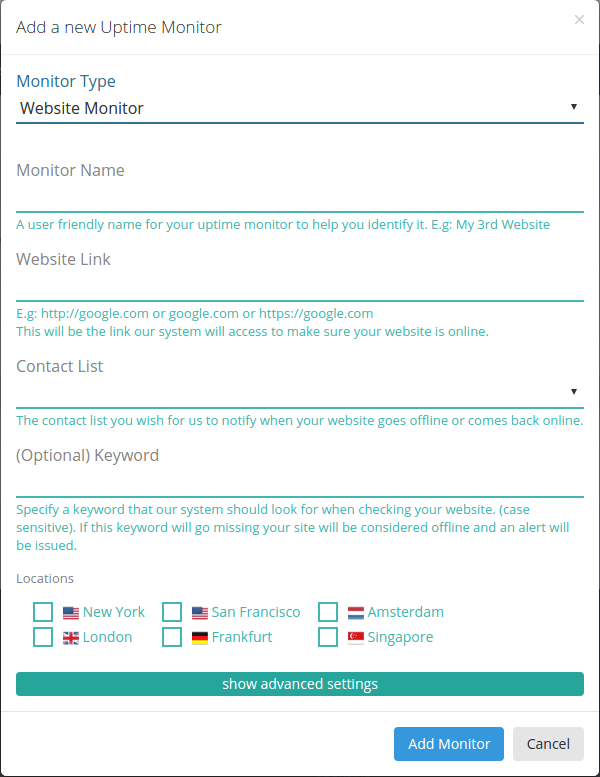 Monitor Name – this should be a user friendly name for your website uptime monitor, that will be shown in your uptime reports and will be used to quickly identify your uptime monitor. Website Link – here you’ll have to fill in the HTTP or HTTPS link to the website you wish to monitor. Contact List – you can either use one of your existing contact lists or select [No Contact List / No Notifications] if you don’t wish to be notified when an outage occurs. Keyword – this is an optional field, but if you do set a keyword here our system will look for it on your website. If not found, the website will be considered offline. Locations – here you can select where you want your website to be monitored from. Timeout – if your website does not load after these many seconds, it will be considered offline. Maximum Redirects – our system will follow this many redirects if your website is redirecting to another link/website. Checkup Frequency – here you can set how often our system should check your website uptime. Number Of Failed Tries – our system will retry this many times before considering your website offline. Number Of Failed Locations – this number of locations have to consider your website offline before issuing an alert. Once you’re done configuring the field, you can click the “Add Monitor” button at the bottom of the window. The website monitor will be added to your Uptime Monitors list and will await its initial checkup. You can always use the “Refresh Table” button to see any changes in your Uptime Monitors list. Your website uptime monitor has now been checked and it’s ready to show you the needed information.